Located just steps from the popular Kalatura Beach, the beachfront Royal Palms Hotel features an outdoor pool, an Ayurvedic spa and 3 restaurants. Accommodations are set in tropical landscapes and feature private balconies. Furnished with carved wood fittings and warm colours, the air-conditioned rooms include a bathroom with a bathtub and hairdryer, satellite TV and tea/coffee making facilities. Guests can exercise at the gym and tennis courts, or play a game of billiards. 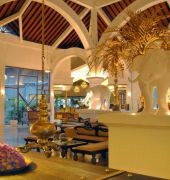 The main restaurant serves international buffets and Western dishes and offers beach views from the open terrace. In addition refreshments are available from the poolside 24-hour coffee shop and 2 bars. Staff can also provide room and laundry services. The Royal Palms Beach Hotel is approximately 25km north from Bentota, 40km south of Colombo and a 3 hour drive from Colombo International Airport. Free parking is provided.